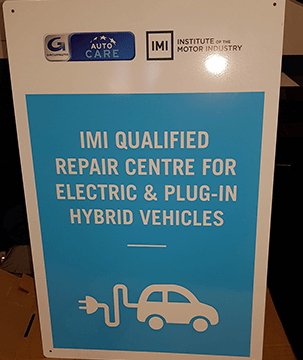 At Autocare Centre Chepstow, we’re proud to have achieved IMI certification to carry out work on electric and plug-in hybrid vehicles. With demand for electric and hybrid cars becoming increasingly popular, it is important that electric vehicle owners can choose a garage in confidence, knowing that all work will be completed in line with relevant safety and service standards. You can find out more about the IMI qualification, how we achieved it and the many benefits of using an IMI qualified mechanic below. Is Your Mechanic IMI Qualified? You may be wondering what exactly IMI is? Well, IMI stands for Institute of the Motor Industry and is the industry benchmarks for auto centres who service, carry out MOTs, or general repairs on any type of electric or hybrid vehicle. Bill from our Autocare centre in Chepstow received his level 3 IMI certification as well as two of our engineers who have already achieved their level 2 qualification and are currently in the process of taking their Level 3 qualification. Now you know that we are IMI qualified, but what exactly did we have to do to achieve this? Attendance at the course – which included everything the qualification required us to know about understanding electrical vehicle systems and health & safety. To complete the course, practical work had to be undertaken to ensure that we could accurately apply our knowledge of electric and hybrid vehicles. The course is completed with a final exam to ensure that the mechanics on the course could demonstrate a good understanding of all the practical and theory elements of the day’s course. With this certification, we can now remove, repair and replace high voltage components including the battery on all types of Electric and hybrid vehicles from the MINI Countryman to the Toyota Prius and many more. Whilst having IMI qualified mechanics is a great achievement for our garage, the real benefit is going to be for our current and future customers – who can bring their electric or plugin hybrid vehicle to us in confidence. Avoid taking your electric or hybrid vehicle to an auto centre whose team are not IMI qualified as not only are you putting yourself and others at high risk, your insurance may become invalidated which makes it illegal for you to use your vehicle on the road. Take care of your tyres – Are you regularly checking your tyre pressure? Ensure your tyres are within the recommend PSI and top up your tyres if not. Check out our top tips for caring for your car tyres for more information. Check your coolant – Keep the coolant levels on your vehicle topped up and remember to check them regularly. Top up your windscreen wash – Especially during the wet and muddy winter months you want to ensure your vehicle doesn’t run out of windscreen fluid – don’t forget empty windscreen wash is an MOT fail. Don’t fully charge your battery – With certain models, this can impact on the lifespan of the battery. For example, Nissan specifically tells the owners of the Leaf to charge it to 80% as this will increase the lifespan of the battery. Don’t let the battery run completely dead – Lithium-ion packs prefer a partial cycle rather than running down. You wouldn’t let your petrol or diesel car run to empty, would you? Most importantly, avoid putting yourself at risk. Carrying out work on electric vehicles should not be attempted without the proper training, knowledge and equipment due to the increased risk of electric shock. With Autocare, you can be sure that your vehicle is seen to by our team of highly experienced IMI qualified mechanics. So, if your electric or hybrid vehicle requires an MOT, Service or repair then we have you covered. For more information about how we can help you with your electric/hybrid vehicle then contact our Autocare Centre on 01291 627137 or fill out a contact form and we’ll get back to you.